We focus on high-quality workmanship with safe, efficient and trustworthy solutions for restaurants, retail outlets and a wide range of commercial properties. With the possible exception of coffee, no energy source is more important to modern business than electricity. Firms require a reliable electric supply for everything from climate control and data storage to lighting. Even the briefest interruption can undermine all of these services, leaving a company unable to do business. 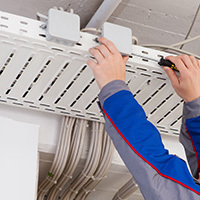 As a professional electrical contractor in Littleton, CO, Electric Blue, Inc. provides the commercial services you need to power up your Denver area business. Commercial Lighting - We illuminate parking lots, landscapes, building interiors, and all other areas relevant to your business. We install the latest devices to minimize energy use and maximize efficiency and are happy to carry out lighting retrofits and studies. Tenant Finishing - We provide lighting, wiring, and other electrical services for rental buildings, ensuring that your tenants have all the power they need. Data Cabling - We perform cabling on all buildings, supplying you with fast, reliable network and all other forms of communication. Temperature Controls - We offer wiring and equipment installation for climate control systems. With our aid, your office can stay warm in the coldest winters and cool during the most sweltering summers. Emergency Services - Whether you are dealing with a sudden power outage, exposed wiring, or any other electrical equipment failures, our team is always ready to help. We are happy to travel to your business, diagnose the problem, and implement a lasting solution. Electric Blue, Inc. serves Denver commercial customers of all kinds. Whether you are wiring new builds or updating equipment on existing offices, we promise to provide the highest standard of electrical service. 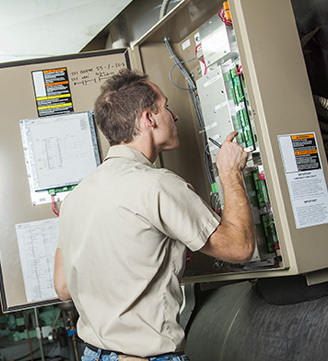 In addition to making sure your electrical systems are working, we minimize the risk of a fire when installing and repairing electrical equipment. 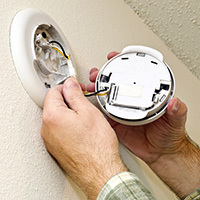 You are unlikely to have a fire in the first place, but if you are, your alarm system is sure to warn you. For nearly four decades, Denver area businesses have consistently ranked Electric Blue, Inc. as one of the top electrical contractors in the region. Our reputation is due in no small part to our focus on every stage in the electrical process. In addition to installing the most efficient electrical equipment on the market, we can conduct regular inspections on that equipment, identifying both current damages and likely sources of future risk. Whenever we detect a problem, we make the repairs and upgrades necessary to eliminate it for the long haul. We thus save our customers money and effort by lowering the risk of electrical problems in the future. Whether in an office building, public space or restaurant, we can help your commercial space run safely and efficiently. Here at Electric Blue, Inc., we are committed to helping our clients feel secure and satisfied with their electric systems. Infrastructure wiring such as irrigation control power, architectural exterior lighting, entryway and sign lighting. Electric Blue, Inc. is always ready to serve commercial and industrial clients, as well as residential customers, in the Denver area. To learn more about our services or schedule facility maintenance for your business, contact us today.